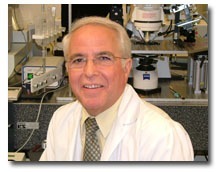 Leo Renaud graduated in Medicine from the University of Ottawa in 1965. After clinical and basic research training at McGill University that included a PhD in Neurophysiology in Professor Kresimir Krnjevic’s lab, he joined McGill’s Department of Neurology & Neurosurgery in 1973 and was based at the Montreal General Hospital. As an MRC Scholar and a founding member of the Centre for Research in Neuroscience, he balanced his time between clinical neurophysiology (EEG and EMG clinics) and the development of an internationally recognized basic neuroscience team focused on neuropeptides and on synaptic transmission in hypothalamic neurosecretory neurons. Rising through the ranks, he achieved full Professorship at McGill in 1981. In 1990, he accepted the offer to assist in the development of clinical and basic neuroscience at the University of Ottawa as Director of Neurology and Neurosciences at the Civic Hospital site. After hospital merger, he continued at The Ottawa Hospital to mentor and support researchers in the Department of Medicine while continuing his own basic research in neurotransmission and neuropeptides as Senior Scientist (Neuroscience Program) and Associate Director of the Ottawa Hospital Research Institute (http://www.ohri.ca/Profiles/renaud.asp). Dr Renaud credits the efforts of many trainees, postdocs, colleagues and international visitors, and the sustained operating and salary support from granting councils for the successes attained during an exciting career in neuroscience. A perspective of the research in the Renaud lab. This lab has fostered a longstanding interest in CNS regulation of neuroendocrine and autonomic functions, hydromineral and cardiovascular homeostasis, stress and arousal. In-vivo and in-vitro investigations in rodent models have sought to characterize aspects of the cellular neurobiology engaged in these functions. Key publications include: RENAUD & BOURQUE, Prog Neurobiol 36: 131-169, 1991 (a review focused on hypothalamic magnocellular neurosecretory neurons); HERMES et al., J Physiol 496:749-757, 1996; ZHANG et al., Neuroscience 141: 2059-2066, 2006 (rapid neurotransmission from the suprachiasmatic nucleus to hypothalamic neuroendocrine and pre-autonomic neurons, and to midline thalamus); WILSON et al., J Physiol 545: 945-960, 2002; WHYMENT et al., Neuroscience 178: 68-81, 2011 (intrinsic properties of spinal sympathetic preganglionic neurons); KOLAJ et al., Front Behav Neurosci Volume 8, Article 132, 2014 (a review of properties and pharmacology unique to thalamic midline paraventricular neurons). Following their structural characterization, the initial availability of hypothalamic releasing factors TRH, LHRH and somatostatin permitted in-vivo evaluation of their actions on a variety of CNS neurons (e.g. RENAUD et al., Nature 255: 233-235, 1975; RENAUD et al., Science 205: 1275-1277, 1979), adding support for the notion that peptides participated in neural communication either as slowly acting neurotransmitters or as modulators. Subsequent investigations in-vitro with patch clamp recording techniques allowed more detailed investigations into mechanisms of action of various neuropeptides in the hypothalamus e.g. YANG et al., Am J Physiol 263: R1333-R1338, 1992; BAI & RENAUD, Am J Physiol 275: R632-R639, 1998; HERMES et al., J Neurophysiol 102: 1834-1842, 2009 (angiotensin, vasoactive intestinal peptide), spinal cord e.g. KOLAJ & RENAUD., J Neurophysiol 80: 1900-1910, 1998; OZ et al., J Neurophysiol 94: 1405-1412, 2005 (TRH, vasopressin and angiotensin on ventral horn neurons), midline thalamus e.g. ZHANG et al., Am J Physiol 290: R1226-R1232, 2006; KOLAJ et al., Neuroscience 147: 1066-1075, 2007; DOROSHENKO & RENAUD, Neuroscience 158: 1560-1570, 2009; HERMES et al., J Physiol 591: 1823-1839, 2013; ZHANG et al., Neurophyarmacology 72:106-115, 2013 (vasopressin, orexins, gastrin releasing peptide, TRH).